Howdy y’all. You know, whenever I have a hard time talking about what’s really going on — or worse, no idea what the other party could possibly be thinking — I like to discuss the weather instead. So I think I’ll start there. 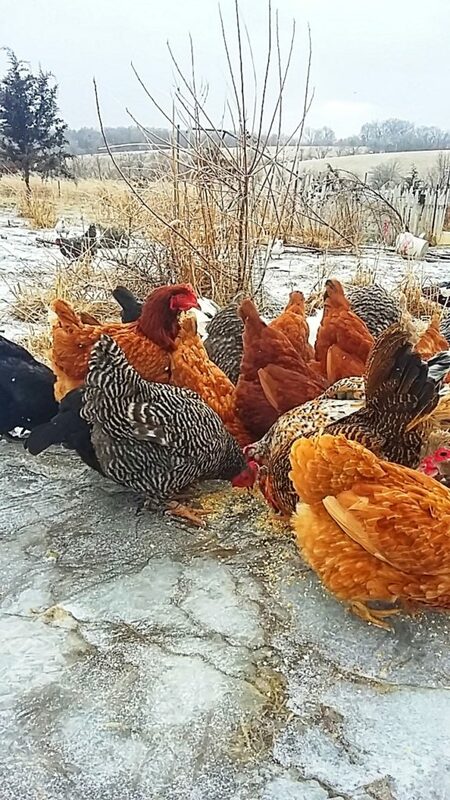 Ben’s chickens scrabbling for oats in the snow. Ben here, writing to y’all from the icy physical and emotional purgatory that is Dancing Rabbit Ecovillage, tucked away in the impassibly slippery rolling hills of Northeast Missouri. This has been the hardest winter I’ve ever experienced, maybe. Then again, I’ve been through some pretty hard ones. Everything outside is glazed over in a thick layer of perilous, unstable ice. As of this morning there is just a dash of snow on top. Making it to the barn, the outhouse, or the nearest “frost free” hydrant is like traversing a glassy stream of discarded banana peels beneath a veneer of deceptively fluffy little beads of ice. I’ve had hay carts fishtail about. I’ve seen bloody chins, and made unintentional snow angels upon the cold gravel. I’ve found it nearly impossible most days to make it off farm to stock up on necessities, like hay, dog food and other vittles. Not only am I physically marooned here for the time being, but I’m emotionally and intellectually trapped; forced to confront daily the horrific news here. It is not lost on me that I have to be very conscious about my words, as do we all. Being careful with my words isn’t something I ever seem to do when speaking, (I also use a few more expletives than when I’m writing) and I don’t particularly enjoy writing, at least not about child sexual abuse. But somehow, for no understandable reason, that is what my week has been about. That and I think I want to take up bobsledding. While in the past I’ve occasionally wanted the work I do writing for the newspaper and website to be financially compensated, I feel very fortunate to be able to offer my perspective, whatever that is, as a volunteer and as someone independent of our non-profit organization. I’m not selling anything, at least not today. What I can say is that, from where I’m standing, nothing makes sense anymore. As I see my friends and neighbors pulled into this ongoing investigation, including my own child, what I want is for this to be just another nightmare; something erased and made null by the light of day. But no, it’s a slippery h*ll-hole; one where I must navigate my own feelings of fear and betrayal, and show up to have the hard conversations with my own children explaining to them that those times when I told them that monsters don’t exist were well-meaning lies, that the world does contain in it some form of evil. The whole time I have to spin through the facts, rumors, self-created innuendo and conspiracy theories in order to reckon with the fact that something so horrible can happen — does happen — in every community, and has happened for all time. Unlike some others, I did not move to community because I have an innate trust in humanity. I came here because I was sick of seeing how people treat each other and completely desecrate their own surroundings. I wanted to try something different. As a young father, I came here because I wanted an environment where the greatest risk my offspring could encounter was something physical, like falling off a sled, getting snagged on a barbed wire fence, or falling face first into frozen creek mud; something where they might shed some blood, but where they could also hold onto their hearts. (Not like the environment I grew up in.) Personally, without kids, I’d have chosen to sleep in a hollow log rather than Dancing Rabbit. It better suits my winning combination of self-important and self-defeating tendencies. My days are filled with bumps and bruises. My little boy is almost three. He falls down, pinches his fingers between magnets (I stash a lot of magnets), somehow manages to clock himself in the eye with a toy truck, and he seems to get stung by bees more than anyone else I know. This stuff happens every day. In fact, anytime we get our strawbale home above sixty degrees, hornets fall out of the cracks in the ceiling, so he’s almost been stung twice this week. I tend to his wounds, no matter how superficial they seem, and I tell him that he will be okay. Maybe I distract him with a snack. Now, when I pick him up from his bumps and bruises, I feel like a liar. Sometimes I can hear the murmuring of others, folks who I do or do not know. I feel their questioning: whether we are doing enough, whether we are doing the right thing, whether or not it’s anybody else’s fault, other than the abuser, when children are abused. Sometimes I’m the one, murmuring these things to myself. Well, I’ve lived here a long time, y’all. I am not to blame. This community is not to blame. After learning there may be a monster is your midst, finger pointing does little. Words fail. Actions speak volumes. I didn’t come here to talk, I came to this place to act, and I believe in justice for all people. How those scales tip is up to the individual. Crimes against children are the worst injustice, and I have no doubt that they will continue to occur among our species, being the sick, mixed up, traumatized bottle of humans that we are. If my words don’t work, if they fail us, well then I have a quote; and I hate quotes. I don’t know what’s happening here. Information comes in at a trickle. But don’t ever doubt that I — that we — aren’t doing enough. As you know, we are cooperating with this investigation, and that comes with challenges. I strongly suggest that if anybody doubts my effort, my struggle, or the bigness of my compassion, that they come here, carefully shuffle a mile in my frigid boots across this forsaken tundra, and say it to my face. I believe in justice. That’s what ultimately motivates my existence here. And I’ve been thinking about predator/prey relationships a lot lately. Just a little bit ago, I went out into the still winter silence to get some air; get away from this screen full of words. My daughter was sitting still as the ice, her outstretched, ungloved hands full of grain, training the chickadees to come, trust her, and take oats from her hand. The chickadees know she’s big, scary, and dangerous. But with time, they gather at her feet, and next to her body, taking the offerings she’s scattered. Up in the gray sky a bald eagle is soaring, hunting. The lazing barnyard dogs take notice, pirouet and bark, scaring it off from the huddled groups of chickens and ducks. The chickadees can do nothing but trust. This is a harsh winter, and they must risk their own lives to take the oats, to see to it that they have a future in this place, that they can go on to rear their young in the springtime that must eventually burst forth. The eagle is not a monster. The eagle is the same as the chickadee. It takes great risks to tear forth and dislodge a piece of meat from the icy landscape. It only does what it does in order to survive, in order to provide for its unhatched offspring. There aren’t any monsters in the natural world. Monsters are a human construct, and only humans can become monsters. But it is only we humans who can do battle with the monsters, ourselves. No chickadee, nor eagle, nor trained dog can balance out the scales of justice, only we can. And things aren’t going to get any better if we don’t. That’s why most of us are here. I don’t want to defend myself, or my family, or my friends and neighbors, no more than I want to offend any of them either. I’d rather live by deed than by word, and so I will stop offering any more words to y’all. What I can do is be honest and compassionate with myself and with my family. And I think I know how to do that. But I honestly do not know what’s going on, or how this is going to impact the community I’ve helped to nurture into being, and the not knowing, that’s what’s killing me. Editor’s Note: This is one person’s valuable take on the most challenging situation Dancing Rabbit has ever faced. As always, other folks in the village have a range of different points of view. My heart goes out to you all, and I am praying for you. I appreciate the effort your community is taking to be open about this difficult situation. It is important to have representatives of the community share their perspective and not have outsiders making up their own narrative without many facts. I also want to acknowledge that none of you can or should share all the facts with the general public. The confidentiality of victims and due process have their own demands. I trust that the authorities and community are handling this well and that the details are none of my business. I am praying that you will all find healing and emerge stronger. Thanks Ben well said as always. The ooze produced by Babylon always seeps into intentional communities. People are damaged by society and are looking for a place to fit in, so they join in, but the damage is done and those people need more help than an ecovillage can provide. But know these people are in every community, not just yours. Be proud open and transparent, you or your people do not bare the burden of one man’s evil deeds. If your tribe is strong and meant to be it will be, but don’t fear the future, for the darkest of change leads to the brightest of beginnings. Love and light to your whole community, special prayers for all your children. Heal them with love and security. Thank you. I’ve been struggling to find words — or the courage — to share with you how this moving, honest, haunting, and poignant essay has affected me. I’ll just go for it…. As a survivor of child sexual abuse, I thank you for revealing the agony of adult heartbreak. Who knew? Until I read this piece, I had no idea! No idea any adult could possibly have been so shattered by a child’s pain, by my pain even. I had no idea. But what if I had I lived in another time, at another place, a place such as Dancing Rabbit Ecovillage? The outcome might have been so different. Ben, I suspect you get where I’m going here, right? I love you! I hold you ALL in my heart.